Memphis, Tenn. – The effort to rename Nathan Bedford Forrest Park, a memorial to the Confederate General, pre-war slave trader, and post-war founder of the Ku Klux Klan, recently began, after countless failed attempts, when one cold January morning this year, the City removed a plaque recently placed in violation of city ordinance by the Sons of Confederate Veterans. Emboldened by city efforts to keep the Park from further honoring Memphis’ slave past, Memphis City Council member, Lee Harris, a 34-year-old law Professor at the University of Memphis, initiated an effort, ultimately supported by nine (out of 12) other Council Members, to rename Forrest Park after Ida B. Wells, the African-American journalist and newspaper editor. The proposal soon caught the attention of two Republican Tennessee state legislators, Rep. Steve McDaniel (R-Lexington, TN.) and Sen. Bill Ketron (R-Murfreesboro), who sponsored a law (the Tennessee Heritage Protection Act, or House Bill 553), to prevent any Tennessee city or municipality from renaming parks, historic battle-fields, schools, local preserves, or memorials that constitute “historic” public property. Bill-sponsor Steve McDaniel, who often portrays a confederate officer in Civil War reenactments and supports preservation of confederate monuments, wrote the bill with outmoded reference to the Civil War as “the War between the States,” terminology used in the recent historiographical past to specifically de-emphasize divisiveness around slavery as a main cause behind the war. To forestall the State’s bill, which McDaniel denies has anything to do with Memphis’ name change effort for Forrest Park, the Memphis City Council passed a resolution on Feb. 6, that changed temporarily the names of Forest Park to Health Sciences Park (after the neighboring Univ. of Tennessee Health Services Center), and the names of two other confederate parks, Jefferson Davis Park to Mississippi River Park, and Confederate Park to Memphis Park. Admittedly, the bland names were thought up under pressure to pass a resolution that the Council would agree to quickly, in order to trump the passage of McDaniel’s bill. A renaming committee has been appointed to come up with more long-term name changes for the parks. 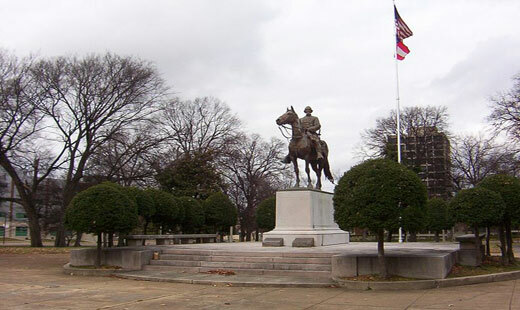 The renaming of Nathan Bedford Forrest Park, which was designed from 1901-05 for the graves of Forrest and his wife Mary (both buried under the equestrian statue of the General), holds great significance for Memphis, and similar southern cities struggling with the legacy of slavery and Jim Crow segregation. As a reaction to the recent renaming proposal, the Ku Klux Klan has planned and sought a permit for a demonstration in Memphis, Tennessee, on Saturday, March 30, the day before Easter Sunday. Counter-demonstrations are also on the agenda, with one group favoring a peaceful celebration of Dr. King’s dream of nonviolent racial reconciliation, and another one favoring a more direct, confrontational encounter with the Klan. The last time the Klan demonstrated in Memphis in January 1998, in opposition to Martin Luther King’s Birthday as a national holiday, peaceful anti-Klan demonstrators got caught in the crossfire of Memphis police tear-gas and a small group of youthful activists favoring violent tactics, who not only called for an end to the KKK, but further provoked police by demanding destruction of “the State.” In their reaction to the melee, the police department officially blamed and arrested some African-American youths, identified as “gangbangers,” for inciting the crowd, though eyewitnesses denied that such was ever the case. This time around, many in Memphis are concerned about avoiding the fiasco of 1998, which tended to focus blame on the anti-Klan demonstrators by some too timid or in secret-agreement with the Klan to either attend or support the event. Also, this time, many in Memphis are taking a more proactive role in developing a counter-message of peaceful, non-violent celebration of the values that have replaced those promoted by the Klan and once representative of the Jim Crow South. While some argue that Memphis has too much on its plate to be worrying about Confederate statues and memorials and while others, on both sides of the issue, warn against erasing (painful) vestiges of the past, others have rightfully pointed out that how a city chooses to present itself to the world and its future generations of citizens, in a city where most of the population descends from slave labor and disenfranchised Americans, matters enough to have this debate over the past right now. The contradictions between history’s remaining traces and the city’s political hopes for the future demand some kind of historical synthesis, or resolution. This collectively desired future will be built together, by both black and white Memphians, and to bring home this point, we need monuments and traditions that begin to reflect and remind us of this new commitment to racial (and social) equality, not, however, further division. Let’s all hope that the long arch of progress and liberation (from the past) bends toward Memphis a little more on Saturday, March 30. Stay posted. Glenn Ramsey teaches history at the University of Memphis. Reach him through Political Affairs.